The Snowflakes needlepoint design is handpainted onto 13 mesh Mono Zweigart canvas. The design area measures approximately 19.5" x 11". 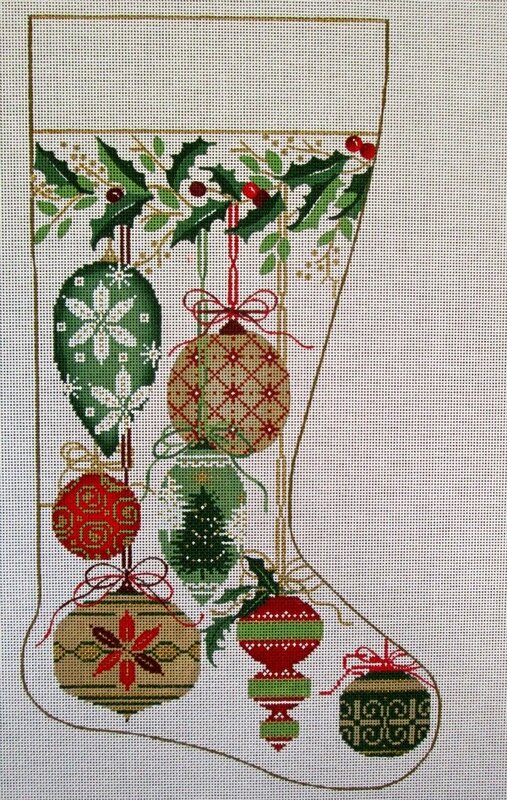 You can purchase this Christmas stocking needlepoint as canvas-only or with threads. Make your choice from the drop-down menu. If you select cotton we send DMC 6-ply floss or; Planet Earth Fiber luxury wool yarn, or; Planet Earth fiber luxury silk thread. These Planet Earth Fibers are specially designed for 13 mesh canvas. This canvas usually ships within 1 week. If it is out of stock it will take up to 6 weeks to ship and we will let you know if this is the case (you can cancel the order at this point if you wish).